Last Sunday, one year old Ella was mooching around the house as she often does, when she found something interesting. Somebody had left some boxes and bags of groceries within her reach, on the floor. She had a sniff and a rummage to see if there was anything edible. She was delighted when she found an opened bag of tasty raisins. She had just started to tuck into them, when she heard somebody calling her from another room. She went through to see them, carrying the half-eaten bag of raisins in her mouth, as if to say “Look what I’ve found”. Many people would just take the raisins away from the dog, and leave it at that. Greg, however, knows better. He has done an Animal Science Degree, and he’d learned that grapes and raisins can be highly toxic to dogs. Some dogs develop fatal kidney failure after eating raisins. 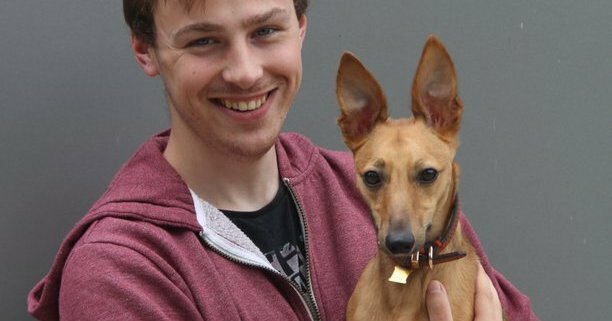 Greg phoned the vet immediately, and then rushed Ella in to see the emergency vet for urgent treatment. Some people may read this and think “What? Raisins poisonous? My dog has eaten raisins before with no problems”. There are two reasons why this may have happened. First, like all poisons, the toxicity depends on the quantity of raisins eaten: large dogs can safely eat some raisins, while small dogs like Ella are far more vulnerable. Secondly, the toxic ingredient in raisins is not always present. A dog may eat several batches of raisins without problems, then be seriously poisoned by the next batch. The identity of the poison in grapes and raisins is still a mystery: despite extensive analysis of grapes and raisins, the toxin has not been isolated. One theory is that it’s an invisible mycotoxin, produced by mould on some grapes. Dogs are far more sensitive to mycotoxins than humans, which would explain why humans are never poisoned by grapes or raisins. So when should an owner worry about their pet eating grapes or raisins? 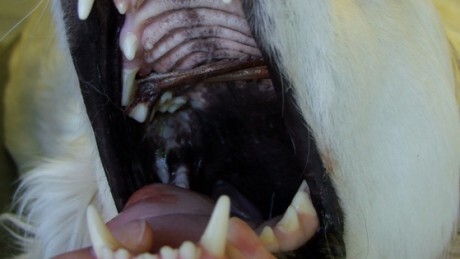 The rule of thumb is that poisoning is likely if a dog eats four grapes, or six raisins, per kilogram body weight. Ella weighs 10kg, so if she’d eaten 40 grapes, or sixty raisins, she was in trouble. It was impossible to know exactly how many she’d eaten, so it was safest to get her treated anyway. 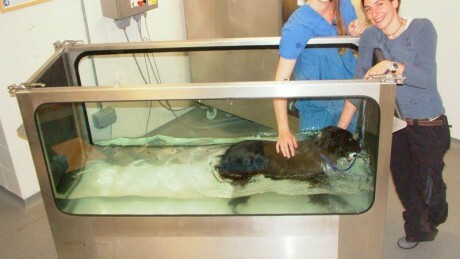 As soon as she arrived at the emergency clinic, the vet made her vomit by giving her an injection. She brought up food plus a large quantity of raisins, but it was still unknown how many raisins may have passed beyond her stomach into her intestines, where any toxic agent could be absorbed into her system, damaging her kidneys. To be safe, she was set up on intravenous fluids, to flush out her kidneys, removing any toxins. After 36 hours of fluids, a blood test was done to check her kidney function, and the results were clear. She was signed off, with no further complications expected. Many other dogs would not be so lucky: their owners might not even realise the risk posed by raisins. If you ever hear about a dog eating raisins, be sure to warn their owner. 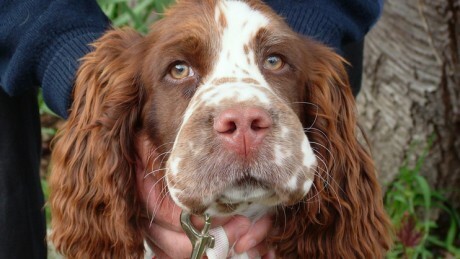 Jessie, a five month old Springer Spaniel who had a severe reaction after being stung by a bee.